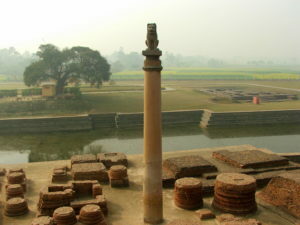 Mauryan Pillars: The Mauryan dynasty had its origin from 321BC. This dynasty was founded by Chandragupta Maurya. This Mauryan Empire was very well known for its stupendous achievements in the fields of art, architecture, literature as well as culture. The pillars were one of the key works as well as striking features marking the Mauryan reign. These pillars, till today, stand as a testimony to the rich architecture which flourished during the reign of this Empire. At certain places, Mauryan art has reflected a perfect blend of Persian as well as Hellenistic art. In spite of all this, the craftsmanship is evidently that of the Mauryan era. pillars erected by Ashoka are one of the finest remains of the Mauryan art. The pillars with Ashoka proclamations inscribed on them were placed or located either in sacred enclosures or in the vicinity of towns. These pillars consisted of two types of stone-the spotted red and white sandstone from the region of Mathura and the beige colored fine-grained hard sandstone usually with small black spots quarried in Chunar near Banaras. The stone was transported from Mathura and Chunar to the various sites where the pillars have been found and here the stone was cut and carried by craftsmen. The uniformity of style in the pillar capitals suggests that they were all sculpted by craftsmen belonging from the same region. These stones were then given a fine polish as was the signature style of Mauryan sculpture. These pillars were mainly erected in the Gangetic plains. They were inscribed with edicts of Ashoka on Dharma or righteousness. The use of art for the purpose of propagating religion was clearly exhibited through the edicts on stone pillars. The terrific level of craftsmanship itself speaks volumes about the greatness of the Mauryan period. Each pillar consists of three parts: the prop under the foundation, the shaft of the column and the capital. The prop is buried in the ground. The shaft made of a single piece of sandstone supports the capital made of another single piece of sandstone. Thin round and the slightly tapering shaft is highly polished and very graceful in its proportions. The capital which is the third part of the pillar consists of some finally executed animal figures such as the lion or the elephant. Out of the abundant pillars erected throughout the extent of the Mauryan Empire, the one at Saranath consisting four lions is the most striking. 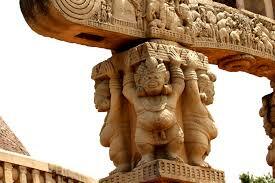 As a matter of fact, this work of art has been used by the Indian Government as its emblem till date. Besides these works of art, rock-cut caves, palaces, and buildings are other such exemplary works of art carried out in this era. 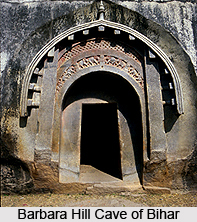 Apart from the works of art, a number of rock-cut caves, palaces as well as buildings came to be erected during the Mauryan dynasty’s reign. Even after almost two thousand years from the period of its construction, the ruins of such works can be witnessed until today in states like Gujarat, Madhya Pradesh, Bihar, and Tamil Nadu.